Whenever postoperative radiation therapy is contemplated in the pelvis, one of the limiting factors in its optimization is the low level of radiation tolerance of the small intestine . Omental fat, synthetic absorbable mesh, or occasionally breast implant have been used during surgery to lift the small bowel out of the radiation field in patients treated for gynecologic or colonic cancers. The omental lid is formed into a pedicle flap, based on either the left or the right gastroepiploic artery, and is usually swung down to the left pericolic gutter to cover the denuded pelvic wall. Such a flap serves both as a vascular bed to absorb the serous drainage and as an X-ray barrier for the bowel loops. Without knowledge of such operations, the radiologist may misinterpret the CT images . After localized resection of a renal lesion, such as a cyst, stone-filled caliceal diverticulum, or a small renal cell carcinoma, surgeons have used perinephric fat to tamponade the bleeding cut surface of the kidney before closing the renal capsule over the cortical defect . This may also be done in liver cysts. Such fat can be a source of error in the interpretation of post-operative CT or sonogram. Also when removing large benign liver cyst or hydatid cysts, the surgeon may choose to fill the vacant area with omental fat (Fig. 10). The organs commonly transplanted in the abdomen include the kidney, pancreas, and liver. Ovaries can be reimplanted for the purpose of protecting them from radiation therapy in the pelvis. In this condition, the transplanted kidney is easily recognizable. Post-operative complications such as infarctions and abscesses, however, may be difficult to diagnose if proper history is not available. Such surgery is undertaken in selected patients in an attempt to prevent, arrest, or reverse progression of diabetes complications. A whole or segmental graft may have been obtained from a cadaver, and placed in the pelvis, which may appear as a soft tissue mass in pelvic CT.
At the time of radical hysterectomy for early-stage cervical carcinoma, the decision to remove or retain grossly normal ovaries in premenopausal patients involves weighing several competing factors. Ovarian conservation and lateral ovarian transplantation may be used when treating such patients . 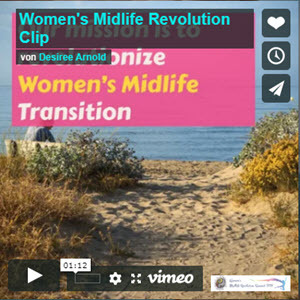 When pelvic irradiation is planned, the ovaries are mobilized at the time of surgery. Then, with their vascular pedicle, they are transplanted near the peritoneum in each pericolic gutter (oophoropexy) and thus are removed from the radiation field. This information is vital to the radiologist so that normal ovaries will not be mistaken for an abnormal mass. Topical hemostatic materials are widely used to control bleeding in abdominal surgery. Oxidized regenerated cellulose is often used and is locally absorbed without tissue reaction [14, 15]. However, if left behind, they can mimic an abscess on follow-up CT in a febrile postoperative patient. Erroneously, larger material may be left in the abdomen and can mimic an abscess. Generally, the diagnosis of retained surgical foreign bodies continues to be a problem as long as non-ab-sorbable materials are used (Fig. 11). Cotton sponges are inert, and they do not undergo any specific decomposition or biomedical reaction. Pathologically, however, there may be either an aseptic fibrinous reaction or an exudative response. Changes on CT related to operations such as gastroduo-denostomy, gastrojejunostomy, pancreaticojejunostomy, ileocolostomy, and other types of anastomoses in the GI tract or the biliary system, are less likely to be sources of pitfalls. In patients who have had a gastrojejunostomy, however, an unopacified duodenal loop can cause confusion in evaluating the head of the pancreas for mass lesions. Ileostomies and colostomies, particularly when opacified by oral contrast or renal excretion of intravenous contrast, are easily recognizable on CT. A non-opacified continent ileostomy or the reservoir from ileo-cystostomy, however, can be mistaken for abscesses or other abnormal fluid collections . A Puestow procedure is a surgical procedure performed for patients with chronic pancreatitis . In these patients, the duct within the pancreas becomes dilated and obstructed. During the procedure, the duct is cleared and attached lengthwise to the small intestine. This increases the amount of pancreatic enzymes secreted into the small intestine. 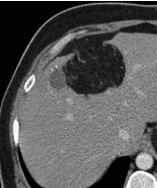 A CT scan after such a procedure can reveal an image that may mimic peri-pancreatic cysts. The acute abdomen is a common and often challenging emergency in pediatrics. 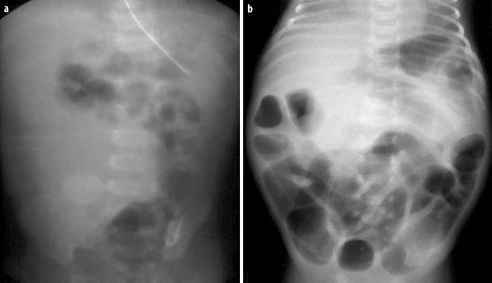 This chapter will provide an approach to the imaging evaluation of children with acute abdomen, highlighting briefly the more common causes of abdominal pain that may require surgery. There is a wide spectrum of pathologies that may give rise to acute abdominal pain. These include congenital and acquired lesions that may present in the immediate neonatal period, or in older infants and children. The acute abdomen is not uncommon in neonates in Neonatal Intensive Care Units and may be the result of several causes, of which the three most significant are congenital bowel obstruction, complications of mid-gut malrotation and necrotizing enterocolitis (NEC). In older infants and children the common causes of acute abdominal pain that may require surgery include acute appendicitis, complications of malrotation, intussusception, and Meckel diverticulum. Inflammatory bowel diseases may also present with acute abdominal symptomatology. Although the above-mentioned causes of acute abdominal pain are due to lesions involving the gastrointestinal (GI) tract, there are many causes of the acute abdomen that are due to abnormalities of other viscera, including gynecological abnormalities such as ovarian torsion; omental lesions such as omental infarcts; obstructions of the biliary and urinary tracts due to stones; and inflammatory processes such as pancreatitis or hepatitis. It has to be emphasized that abdominal pain may also be due to referred pain from extra-abdominal pathologies such as pneumonia or pleural effusion. Diseases such as sickle cell disease, Henoch-Schonlein purpura and hemolytic ure-mic syndrome may also cause significant acute abdominal pain. During imaging of the child with acute abdominal pain these other pathologies should also be considered. Fig. 1. CT scan after intravenous contrast injection in a 3 year old boy with minor abdominal trauma. a Scan shows large solid mass (outlined by electronic cursors). Fluid is noted in the right flank with a fluid fluid level (arrow). b The right kidney is displaced forward by a large perinephric fluid collection with a fluid fluid level (arrow). The mass is noted to arise in the kidney. This is an example of a marked amount of hemorrhage occurring following minor trauma to the abdomen in a patient with an underlying Wilms' tumour consider non-accidental injury or abuse when certain traumatic lesions, such as hematomas of the left lobe of the liver and duodenum or pancreatitis are found, especially if these are present in combination. (i) Sonography Ultrasound (US) has come to play an increasingly important role in the management of children with acute abdominal pain, and has replaced the plain abdominal radiograph as the initial modality of choice in many clinical situations. 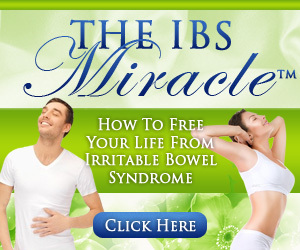 The major advantages of US are that it does not utilize ionizing radiation, it is relatively inexpensive and the abdominal viscera including the bowel can be well-delineated. This allows the confirmation or exclusion of many pathological entities. (ii) The plain abdominal radiograph (AXR) remains a standard method for the evaluation of the acute abdomen in some clinical situations. It is essential when peritonitis is present and perforation is suspected. All neonates with an acute abdomen are evaluated with AXR. This modality is essential for the evaluation of conditions such as NEC and congenital bowel obstruction. In the former the AXR may be diagnostic and in the latter the findings guide the choice of subsequent contrast examinations of the gastrointestinal tract. 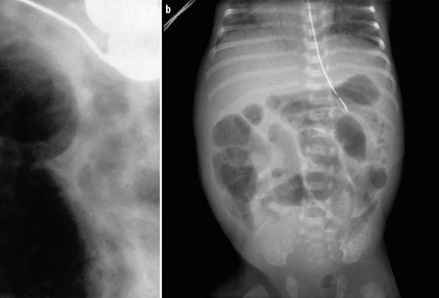 Views with a horizontal beam are essential to exclude the presence of free air due to bowel perforation and can be performed with the neonate in the dorsal or lateral decubitus positions. In older children the diagnosis of intestinal obstruction can often be made on the supine film alone. A search for air fluid levels on the upright view does not always add extra information and a search for free air in the abdomen is often more easily achieved using a lower radiation dose with a single upright view of the chest, which also serves to exclude lung pathology. However, AXR findings are often non-specific in both the neonate and older child, limiting its utility. (iii) Contrast studies of the GI tract are essential in certain conditions such as suspected mid-gut malrotation and congenital bowel obstruction. In the latter situation the contrast enema is important for diagnosis and therapy in some patients. (iv) Computed tomography (CT) is reserved for more complicated imaging situations where US may not provide all the information required, e.g. in children with appendicitis when gas obscures the right lower quadrant, in older, obese children, or in children with abscesses. CT without contrast injection is also extremely helpful for the delineation of urinary stones that are not clear on US. (v) Magnetic resonance (MR) has a very limited role in children with acute abdominal pain. However, it can depict anatomy exceptionally well in certain conditions, where it may be used to complement findings on US. Such conditions include biliary and pancreatic duct anomalies as well as gynecological disorders such as complex anomalies associated with hydrocolpos. Acute appendicitis is a common clinical entity in pediatrics. In many patients clinical diagnosis can be easily made and no imaging is required prior to appendicecto-my. However, imaging is extremely important in children who present with non-specific features. We use US as the modality of initial choice and try to reserve CT for those patients in whom US examination is inconclusive. We also use CT in patients with abscesses, in order to better define the extent of the abscesses prior to drainage by the interventional radiology team. Fig. 2. Sonograms showing examples of acute appendicitis. a Longitudinal scan through the appendix shows distention of the appendix (distance between cursors measured 0.8 cm). The appendix was non-compressible and there is echogenic tissue surrounding the appendix due to edema of the surrounding mesentery. b Transverse scan through the appendix (arrow) shows a distended non-compressible appendix with surrounding edema of the soft tissues. c Example of appendicitis involving only the tip of the appendix. The tip of the appendix is distended to well above 0.6 cm (black arrow). The white arrow indicates the presence of an echogenic appendicolith with posterior shadowing. This example illustrates the importance of searching for the tip of the appendix mesentery, hyperemia of the wall of the appendix on color or power Doppler examination, the presence of an ap-pendicolith and local fluid collections or abscess formation. There are other conditions that may cause the appendix to become thick-walled and dilatated, including cystic fibrosis, Henoch-Schonlein purpura and inflammatory bowel diseases. The radiologist plays an exceptionally important role in the diagnosis of this condition, which can potentially lead to bowel necrosis requiring extensive bowel resection and may even be fatal. (iv) Fixation of parts of the midgut by peritoneum. The normal process of rotation and fixation is essential for the midgut to assume its normal mature position in the abdomen. However, abnormalities due to the arrest of rotation and/or fixation may occur at any phase of the above process and may involve only part or all of the midgut. This may, therefore, lead to a number of variations of malrotation and/or malfixation. The vast majority of these variations are associated with clinical symptoms that usually present within the first few months of life and may be life-threatening. Others may be associated with few or no symptoms and are incidentally found. Malrotation usually leads to obstruction of the duodenum by (i) peritoneal (Ladd) bands that anchor the cecum to the retroperitoneum across the duodenum in the right upper quadrant, (ii) midgut volvulus due to the narrowed base of the mesentery or more rarely, (iii) internal hernia. The clinical picture and imaging appearances depend on the nature and degree of obstruction as well as the presence or absence of vascular compromise. (i) Plain abdominal radiograph: In typical cases there is gaseous distension of the duodenum (Fig. 3), but the appearance may often be non-specific or even normal. In some patients the duodenum may be filled with fluid and not visible and only the stomach is distended with air. In children with severe vascular compromise due to volvulus, the entire small bowel is dilated (with air fluid levels), and resembles a low bowel obstruction or ileus (Fig. 4). One should therefore never rely on plain film findings to rule out malrotation. In any child where there is a suspicion of malrotation, particularly those with bilious vomiting, contrast studies of the GI tract or sonography should be carried out. (ii) Contrast studies of the GI tract: In the past there was much debate about whether the upper GI series or contrast enema is the most effective way to diagnose malrotation. Today most institutions rely more on the upper GI series but if in doubt - do both! On the upper GI series the duodenojejunal flexure is absent and the proximal small bowel typically lies in the midline (Fig. 5). Rarely an internal hernia may be delineated. On the contrast enema the cecum is usually in the right upper quadrant and the ascending colon and hepatic flexure are not correctly positioned. One pitfall in diagnosis is the variation in position that the above structures may assume normally or with malrotation. Meticulous technique is critical to either type of study in order to delineate these structures accurately. The use of too much or too little contrast material may render the study undiagnostic. (iii) Sonography: Sonographic signs have been recently described in malrotation, but a normal sonogram does not exclude malrotation. Abnormalities that have been described include: (a) fluid distention of the duodenum, (b) inversion of the superior mesenteric artery and vein relationship - unfortunately this can be seen in a small proportion of asymptomatic, normal individuals, and (c) the whirlpool sign seen with midgut volvulus (Fig. 6). Rarely, ascites may be present in neonates. NEC usually presents in infants in the Neonatal Intensive Care Unit - and is found more commonly in premature neonates. The classic presentation includes abdominal distention and blood in the stool. The radiologist plays an important role at the time of diagnosis of this condition, during follow-up and in the detection of later complications such as strictures. (i) AXR: At the time of diagnosis there are three abnormalities that may be present on AXR, including bowel dilatation, intramural gas and portal venous gas. Bowel dilatation is present in almost 100% of the patients with NEC and the degree of distention of the bow el usually correlates well with the clinical severity. Follow-up AXR may show asymmetric dilatation and fixed loops in those infants whose status deteriorates. Intramural gas is not present in 100% of patients and the amount of intramural gas does not always correlate well with the degree of clinical severity (Fig. 7). Portal venous gas is usually present in patients with severe NEC. Disappearance of intramural gas and portal venous gas does not always correlate with clinical improvement, as the gas eventually disappears even in those children who deteriorate clinically. (ii) US is an extremely useful modality for investigating patients with NEC, as it can provide information regarding the presence of intraperitoneal fluid, bowel wall thickness and bowel perfusion (using color or power Doppler sonography) (Fig. 8). US is more accurate than AXR for documenting the presence of free and focal intra-peritoneal fluid and can also define the character of this fluid. It is well known that not all patients with NEC will show free air on AXR following perforation, and may present only with the presence of free fluid. We have shown in the early phases of NEC that the bowel wall is quite thickened, while in more severely affected patients the mucosa and submucosa of the bowel sloughs into the lumen of the bowel, leaving a markedly thinned bowel wall, more prone to perforation. Thinning of the bowel wall can be documented with sonography. We have shown that in NEC the bowel (particularly thickened bowel) becomes markedly hyperemic and this indicates the presence of viable bowel. However, absence of bowel perfusion in single or multiple loops of bowel (particularly when the bowel wall is thinned) indicates the presence of necrosis and may warrant surgical intervention even if there is no free air present on the plain radiograph. Sonography comes to play a more important role in the follow-up of patients that do not respond to medical management and those who deteriorate clinically. In these patients US may provide information that is not depicted with AXR. Meckel diverticulum most commonly presents as painless rectal bleeding due to ulceration caused by the presence of ectopic gastric mucosa. These patients are usually adequately diagnosed and managed following a ra-dionuclide scan. In under 50% of the children presenting with Meckel diverticulum clinical findings are more complex, with a combination of abdominal pain, vomiting and occasionally, rectal bleeding. In children with acute pain the diagnosis is often difficult and non-specific. US can be used successfully to document the presence of an inflamed or hemorrhagic Meckel diverticulum. In this situation the Meckel diverticulum has a variable appearance and may simulate the presence of an inflamed duplication cyst, appendicitis and sometimes a small intussusception. When this somewhat atypical appearance is present on US one should consider the diagnosis of a complicated Meckel diverticulum rather than the other pathologies it simulates. See the chapter, 'Intussusception: An Approach to Management' for a review of this important cause of acute abdomen in Pediatrics. 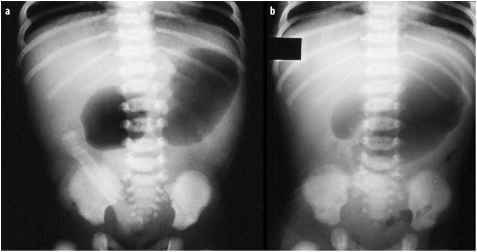 Obstruction due to congenital lesions may occur at all levels of the GI tract and are, from a practical point of view, divided into 'high' or 'low' lesions. The high obstructions denote lesions of the esophagus, stomach, duodenum and upper small bowel. 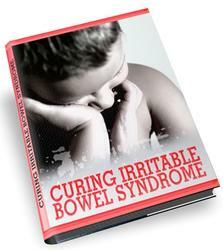 The low obstructions in clude lesions of the lower small bowel and large bowel, and anorectal malformations. The distribution of dilated bowel loops on plain radiographs usually enables relatively easy differentiation of high from low obstruction, by evaluating the number of visible gas-filled loops. Fluid-filled loops may be difficult to visualize on plain radiographs and may masquerade as free fluid or masses; thus, they occasionally complicate the picture. It should be emphasized that the differentiation of dilated gas-filled small from large bowel loops may be impossible in neonates. Free air is not usually evident in these patients unless the diagnosis is delayed. Intramural air (and even portal venous gas) may be seen proximal to high grade obstruction, but it is much more commonly seen in NEC. Calcification may be present in the peritoneum (meconium peritonitis) due to prenatal perforation, in the wall of the bowel proximal due to an atresia, or in the bowel content within the lumen occasionally proximal to low obstruction. Most complete high obstructions are easily diagnosed on plain radiographs. If the diagnosis is in doubt, air can be injected slowly via a feeding tube into the lumen of the GI tract to confirm or exclude an obstruction. In incomplete obstructions (e.g. malrotation and stenoses), positive water-soluble contrast agents are required to confirm the level and nature of obstruction. Low obstructions include ileal and colonic atresias, meconium ileus, functional immaturity of the large bowel, Hirschsprung's disease and anorectal malformations. Although there are some features on plain radiographs that might suggest any of the above conditions, radiographic findings are often non-specific. Differentiation of these conditions, therefore, will depend on other factors such as clinical history and physical examination. Invariably, these conditions require the use of a water-soluble contrast enema to define the distal colon and ileum for a more confident diagnosis. The contrast enema may also prove therapeutic in patients with meconium ileus or meconium plugging in the colon. Manji R, Warnock GL (2000) Left paraduodenal hernia: an unusual cause of small-bowel obstruction. Can J Surg 44:455-457 Miller SF, Seibert JJ, Kinder DL, Wilson AR (1993) Use of ultrasound in detection of occult bowel perforation in neonates. JU Med 12:531-535 O'Hara SM (1996) Pediatric gastrointestinal nuclear medicine. This seminar concentrates on dynamic examination carried out using videofluoroscopy or digital cinematography. After a short introduction on topographic and functional anatomy, radiographic anatomy, physiology and examination technique, cineradiographic sequences of normal deglutition, dysfunction of the pharyngoesophageal sphincter and typical examples of neuromuscular diseases affecting deglutition will be analyzed in detail. After this seminar, participants should be able to correctly analyze impairments of swallowing and, with the help of a decision tree (Fig. 1) and a differential diagnostic table (Table 1), be able to allocate an individual case to the correct group of differential diagnoses. Liquid barium sulfate suspension is utilized for routine examinations. Semi-solid or solid (tablets) preparations may also be used in specific instances. Water-soluble contrast media are used where perforation is suspected. When used in patients with suspected aspiration, the preparations must be non-ionic and of low osmolarity, as aspiration of ionic contrast agent can lead to severe lung edema.